Nature can be a beautiful thing, but it can also be molded into whatever we want it to be, even if that means twisting it into disturbing imagery. The towering emerald canopies of a forest can be both magnificent and nightmarish. Do the shadows they cast hide terrors or cause unease to those they fall on? Is there a danger hidden within them, something rooted in the rotten core of Mother Nature? We can explore our surrounding environs in a myriad of ways, but it’s through horror that the team behind Alder’s Blood aimed to view the natural world. My introduction to Alder’s Blood, a new turn-based tactical strategy game from the team at Shockwork Games, was a glimpse into the design process of the Victorian-era setting. 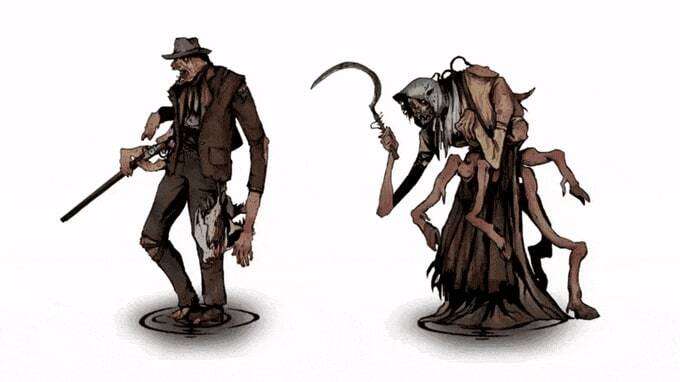 Concept artist and illustrator, Alex Siwek, had the pleasure of bringing the world of Alder’s Blood to life. To do so, the talented artist drew inspiration from the dreary and decaying aspects of nature. It was Alex’s design and concept art that sucked me in before I even watched a second of gameplay. A world strewn with tombstones and touched by the decay of evil piqued my interest, and so I dug deeper. Alder’s Blood is more than just a visually appealing romp in a world haunted by monstrous forces. It’s a thought-out tactical experience that uses Alex’s design as a launching point for a much bigger adventure filled with grotesque creatures, contemplative gameplay, and plenty of features any RPG gamer will love. When you delve into indie gaming, it’s not uncommon to find developer’s that want to rush a core concept without fleshing out solid gameplay. Alder’s Blood isn’t going to be one of those instances as the team put plenty of thought and effort into mechanics that further enhance the overall experience. Before getting into those, it’s important to understand the base game that awaits. Alder’s Blood sets gamers out into a Victorian world filled with werewolves, deadly mutated villagers, vampiric fiends, and other supernatural enemies. As hunters of these foul beings, it’s up to them to trudge through the darkness of haunted forests and overrun castles to find a way to stop the corruption that’s twisted the land into a living nightmare. Maybe we’ve seen the same basic concept before, but how Shockwork Games approaches it is what separates Alder’s Blood from other titles. As the Kickstarter campaign boasts, Alder’s Blood is a tactical strategy game that “raises the tactical decisions of the player over the mere luck of RNG rolls.” Similar-styled games like XCOM 2 rely on a “random number generator” to determine the success of a hit, much like the roll of a dice. Shockwork Games aims to ensure that player actions have a more significant impact on gameplay than a randomized number for a playthrough that’s genuinely driven by strategy and tactical thinking. Avatars in this nightmarish journey are hunters bound by a “Hunter’s Credo,” a sort of code of honor they must follow in their quest to quell the darkness. Each hunter features a unique playstyle and skills, which come in handy against the worst feral monsters. Build your most efficient team of hunters to dominate the world of Alder’s Blood, combining abilities for the best tactics against werewolves, spirits, and other mutated and horrific creatures. The strategy starts at team building, but to know who to bring into the world, players must consider other factors. The “Senses System” brings in elements you’d expect to see in a survival horror game. Programmer and designer Kamil Wojcik discusses the use of smells, which can alert enemies to a hunters presence or be used by crafty players to set traps. The Senses System shows the depths Shockwork went to for a new and complex concept. As Wojcik explained in a developer blog: “Hunting is a basic premise of our game and we wanted to base it on common senses. Sight and hearing were obvious, but I wanted to also include the sense of smell.” To implement such a system, Wojcik had to first understand the science behind our olfactory nerves and how weather and environmental conditions affect scent. It was a ton of research that translates into one of the game’s more unique attributes and maybe its most interesting components. The world is shrouded in darkness, and Shockwork wanted to utilize the shadows efficiently with the “Darkness System.” Adding another layer to the game’s strategic gameplay, this system can change how a player approaches a battle. The Darkness can hinder progression by spawning or altering enemy stats but can be used to the hunter’s advantage. It may require a small sacrifice, but sometimes progress does come at a cost. When a player embarks on a mission, they take with them a team of customizable characters. As with similar games, each hunter can be equipped with different skills, items, and weapons to outfit them for the battle ahead better. Every decision a player makes will determine the outcome of the mission, including paying close attention to the cycles of the moon. Hunt during a full moon and monsters may be at their most active, but wait for the glow of the moon to dissipate, and you may be faced with swarms of creatures that prefer the darkness. If you think that things seem complex enough, the game gets even more in depth. Not only do Action Points determine how much you can do in a turn, hunters also have stamina. Run out of stamina, and an exhausted hunter will be left vulnerable to enemy attacks. It’s all about understanding the strengths and weaknesses of both the hunters and the monsters. It won’t be easy, but astute gamers will be able to create a well-oiled machine on the battlefield once they’ve perfected every aspect of Alder’s Blood. Will Alder’s Blood be the turn-based strategic and tactical horror game it promises? The dedication and hard work of the team at Shockwork Games point to an affirmative. Alder’s Blood is currently slated for release on PC with potential for console release in the future. Join the campaign on Kickstarter and show your support for the latest in turn-based tactical strategy gaming. Read next: What does Hero 27 mean for 'Overwatch'? What does Hero 27 mean for 'Overwatch'?